I have a very amateur level of competence when it comes to electronics, circuits, etc. Am looking at a Youtube project that combines a PEMF device (Pulsed Electromagnetic Field Therapy) and a RIFE device (Royal Rife, Tesla, etc).. dual circuitry. There are two or three elements in the hand drawn schematic that I do not understand and was hoping someone could put eyes on it and identify those pieces. I have sourced almost all of the parts, but a parts list would really have helped. I’ve tried to ask the originator of this schema but have yet to receive any replies. The engineer who drew this up posted barebones schema and vid, and I can almost get through it. Almost. So looking to this learned group for any help to interpret this schema and video. Am attaching an image with 2 balloons w/text and pointers asking “what is this?”, etc. Plus an additional question is… on the front panel there appear to be two, or three different kinds of lights. Are they all the same(for pulse, pulse, out, out and power), as in LEDs?, Or might they different kind of lights for the three different types/labels. Cannot discern from the schema and vid. Am also attaching some images that snapshot the project, taken from the video. Fwiw, the end game of this is the PEMF aspect assist my wife who lives in chronic pain (6 total joint replacements for instance). Additionally, she is a liver transplant recipient.. so lots going on here. The magnetic pulse fields do provide a measure of relief. Hence why am pursuing this. The rectangle on the left is another 1.5K resistor, like the one on the right. The stripe-y symbol is the industry standard symbol for Ground (GND). Ground is the reference against which all other voltages in the circuit are measured. The HP power supply makes a 19 V output. That is +19 V with respect to its ground. If the timer module makes a 5 V output, that is 5 V with respect to its ground. For multiple components and circuits to work together, they all have to agree on a common "reference potential". In other words, all of the grounds have to be connected. Sometimes this can be tricky, but your system is pretty straightforward. What does "INPUT" (lower left corner) connect to/from? Depending on what it is, P2 might be shown incorrectly. This is not the world's best schematic, but there is nothing blatantly wrong electrically. Thank you SO much for this lesson. I presumed the left item was the same resistor as on the right, a 1.5K resistor. On the 'ground' symbol, yes, that is what I surfaced as well. Tho here is an additional question... what is the 'ground' connected TO? Yes, a sophomoric question, but not having an electronics background, and YES, agree the schematic is not the world's best which is why I struggled to decipher it... If you could counsel me on what this 'ground' connects to, I would be most appreciative. The "INPUT" is a connection to a frequency signal device. In this instance, it is connected to the audio output of a Windows machine, running a frequency program called 'Frex', out of Australia. Terrific frequency program. Anyway, I am most appreciative that you have taken the time to respond, and educate. You are the only person out of a slew of pleas for help that has responded. Hence am in your debt. Yes, I am reaching out as I explore a lot of modalities to help my wife. Liver transplant (26 years), 6 total joint replacements, and she lives in chronic pain. I built a simple DIY PEMF device using a camera flash, and it does have a positive effect with reducing her pain. Tho am well aware that more is not necessarily better. So am pursuing primarily the PEMF side of this device in a pursuit of a stronger device that may help more. Commercial devices, aka Doug Coils among other PEMF type device, can run in the many thousands. Hence why I am pursing a DIY effort. Hope that you will respond. Your original response is much, much appreciated. The box thing in your circle as mentioned is the resistor for the Led, it just flashes when theres a pulse on the output. It took me a second but I think I know what the gnd legend connection is for, the signal generator has 2 supply terminals, one for power + and one for power -, and also has 2 terminlas for the output, one is the signal (marked Pwm on your sketch) and the other is signal ground, which is the ground symbol on your drawing. I've seen Tens machines that use electrodes, but nothing like this, let us know if its successful. Guy I used to work with has a spiral fracture in his leg that was not healing fast enough. Wore a PEMF rig for a few months, all better now. Belt pack with batteries and drivers, velcro pad with coil inside wrapped around the calf. Insurance covered 100%, an interesting statement of credibility. Hello, thought I would try and come back for a follow up question given that I received responses from here, to the prior plea for help on this circuit. Note that I was able to raise the engineer who crafted this original circuit and he gave an answer that I somewhat understand… but hoping someone could clarify the addition of two resistors that are NOT part of the original schematic. I have attached a visual snapshot of the entire circuit with these additional resistors, a second snapshot zoomed in to point in question, and also the overall schematic that does NOT include these additional resistors and what I believe is a fuse that am looking for help on answering. So….. I understand the LED for power indicator is optional sure. I would like however to add this LED to the circuit. What I am looking for help on is… are these resistors simply a 1K ohm, ½ watt resistor? And by serial, how are they wired? Note that this is for a 19v power supply which is used in the original design. But this circuit can go up to 36v. So for a 19v power source, what are these resistors, how would this be wired in a 19v power source? Serial as in 1K ohm + 1K ohm soldered to the pot? Or how would this be wired? I cannot quite make this out in the snapshot. And secondly, what would be required if one were utilizing a 36v power source? A different resistor? How would that be wired? And, I assume the blue object in the snapshot is a fuse??? Is one really needed and if yes, can someone also clue me in on its description so I can order it, and how is it wired within the mix of the 19v and 36v circuit? LED resistors - he used two resistors in series because that is what he had, or that decreases the power dissipation in each one, or some other reason. If he used a single 2K 1/4 W resistor (looks like a 1/4 W body size to me), the power dissipation would be 144 mW. This is over 50% of the max power dissipation rating, a line that should not be crossed for good long term reliability. For a different power supply voltage, you need a different total resistance for the same current (hence, same brightness). A 36 V source would be 34 V across the resistor. For 8.5 mA LED current, you end up with 4.47K and 0.29 W.
The blue part almost certainly is another resistor from a different manufacturer. Yageo (Digi-Key favorite) uses a blue body for their 1% tolerance parts. One point of interest, the PWM signal generator (I have some bare PCB versions of it) outputs PWM pulses of the full supply rail, so in this case 19V odd p-p. 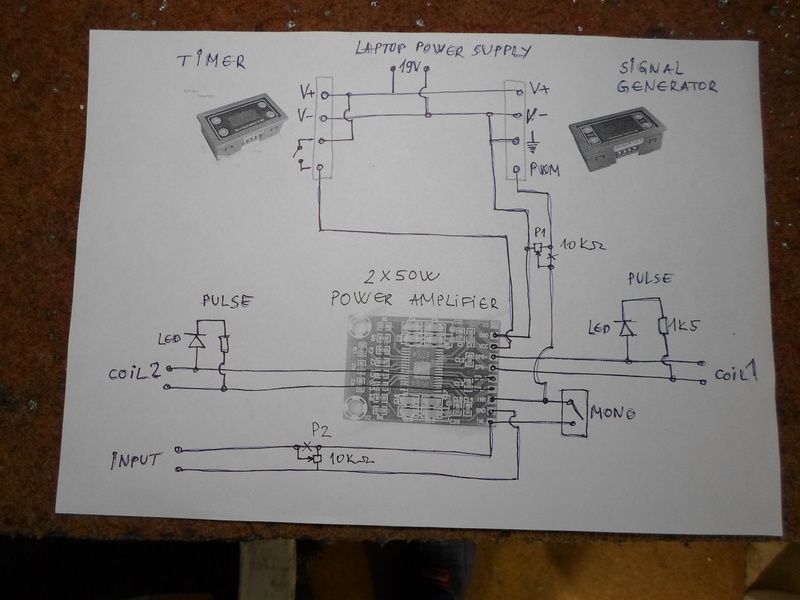 The only attenuation between the 19V and the input of the amplifier is the 10K pot, so it will only work at the very lowest volumes, above that the amplifier will be overloaded and the pot will make no more difference. I would suggest fitting a series resistor between the output of the module and the top of the pot (dropping the maximum level to less than 2V) giving a much greater useable range on the pot. Disconnect the + wire to the Led, connect one end of a resistor to the Led +, then connect the other end of the resistor to the wire that went to the + of the Led. Roughly you can multiply the Led voltage by 100, then choose the nearest resistor value, so 19v = 1900 ohms, or nearest 2200 ohms or 2k2 would work, and 36v 3600ohms or 3k9 would work, over 12v you'd need a 1/2 w resistor.